At Corpus Christi Garage Door Repair, we’ve worked with builders, business owners, general contractors and property management companies throughout the Corpus Christi, Rockport, Aransas Pass, Port Aransas and surrounding areas for many years. Regardless of whether you’re looking to add doors to a warehouse or car wash, or maybe recreational facility, firehouse, storage building, or any other type of commercial facility, we can help you decide the best door system for you and your company. We offer everything from sectional doors, aluminum doors, glass doors, insulated steel doors, rolling steel doors, high speed doors, fire doors, grilles, sheet steel doors, dock loading doors, and much, much more. We understand that as a business owner, you know what it means to watch the bottom line—which means you need to find the doors that are most appropriate and efficient for your industrial or commercial needs. We guarantee that the materials and quality of our commercial garage doors will provide you the strength and reliability that will allow you to perform to your capacity. Our team can assure you that we offer the best business solution when it comes to commercial garages. Working with our skilled technicians, you’ll quickly recognize that our staff are experts at the installation of commercial doors, and we can help you determine the right door for your application and your business. We’ll show you a variety of styles that best suits your building, and we’ll provide you with the options available including door options and door operators. After many years in the industry, we know that there are a lot of businesses who use and have important wants and needs for a garage door. These businesses rely on these doors to function properly and keep up with the daily operational requirements that protects and drives the workload. When something happens with the doors, never hesitate to reach out to our skilled technicians here at Corpus Christi Garage Door Repair for fast replacement and installation. Overhead door installation is extremely important because your needs may differ greatly than the needs of others—particularly our residential customers. Commercial garage doors are generally more sturdy and powerful than residential ones, and there are different styles to be considered. It’s important to understand that the type of industry you specialize in and the amount of space you have to work with are both important factors to consider before installation. In many cases, doors with energy-efficient insulation are required, and in other situations, our clients may need a door that can endure constant operation without fail. Additionally, other doors may also be equipped with security features. These features can include motion-controlled lighting, over-voltage protection, timed operations, and alarm systems. Our staff is well-educated about various makes and models of commercial garage doors on the market, and we are happy to advise you on doors that can best fit your needs and your company’s budget. Our technicians can even install customized doors with no trouble at all, and only do so using the best tools and equipment. 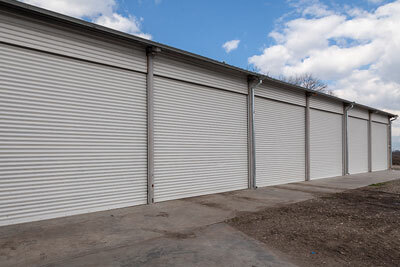 In our experience, there are typically four types of common garage doors that are utilized in commercial use. Let’s start with rolling doors. These doors are perfect for limited spaces and provide a significant amount of security. Next, fire doors are built similarly to rolling doors, but are specialized doors that can electronically connect to fire alarm systems inside of the building. Sectional doors come in more varieties than the other options, and windows are often includes among the panels. Finally, traffic doors are made of PVC or Polyurethane. These doors are great for high-traffic areas, but are intended for locations where security is not a major concern. Despite what kind of door your business requires, our team is happy to share our expert advice to assist you in making your decision. We promise that the garage door we install on your property is the best choice for you. In the end, finding the right garage doors for your business means analyzing what kinds of needs and specifications must be met at your workplace. If you are a small business that handles deliveries, you might only require a garage door system that is reliable and secure to safely store a few vans at night. 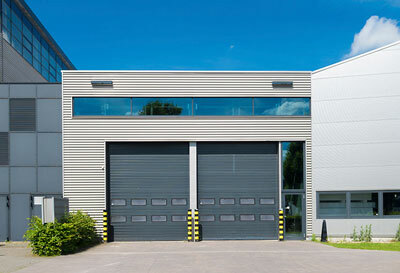 On the other hand, if you are a more industrial-based facility that utilizes a fleet of trucks which enter and exit the garage constantly, you will likely need a door that can handle more sophisticated demands. No matter what you need, contact our team to find out the best options for your business.